I would have thought reindeer needed leafy greens, veggies, and fruits to fuel that Christmas Eve trek around the globe. 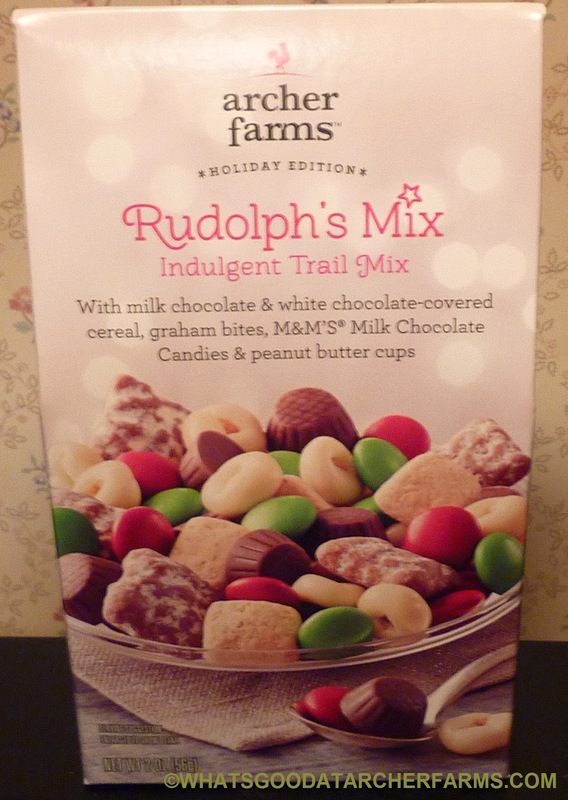 Turns out those eight tiny fellows—or at least their red-nosed ringleader—gorge themselves on sugar and chocolate-laden trek mix for energy. Who knew? It's truly an "indulgent" mix, as the box plainly states. For nutrition facts, please click here. I don't want to put them up in this review because I don't want to think about all the calories I just consumed. Was it worth it? Yes, for the most part. Generic M&M thingies*: Meh. We've all had these before. Chocolate with a candy shell. Graham bites: Better than just plain old graham-flavored cereal, these bites are fairly thick and crunchy. They make a good base for a sweet, desserty trail mix. Peanut butter cups: Everybody's had peanut butter cups before, but these are pretty good. Quality PB and chocolate can't hurt a mix like this. White chocolate-covered generic Cheerio thingies: I don't think I've ever had white chocolate-covered Cheerios before, but they're actually really tasty. I wonder what a bowl full of these with milk would be like. 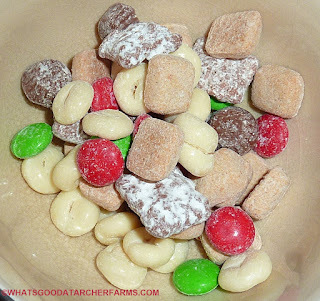 Puppy chow Chex-type pieces: You ever had puppy chow? Or muddy buddies? These things are just like that, right down to the powdered sugar. They don't strike me as being "chocolate-covered" exactly. They're just like Chex cereal squares with a sugary glaze over them. Anyway, they're tasty. All the components work together reasonably well, although I'm always wishing there were fewer of the M&M's and more of the grainy elements. There's a really big jar of this stuff available at Target for something like $11. I guess that would be good for a Christmas party or something like that. We just got the little $2 sampler-type deal. I don't think I could eat any more than that anyway. *They're actually name brand M&M's, not generic.